There are tons of card games on the Internet, but they all lack something tangible, like real playing cards. If you wanted to play a game of poker with your friend but don’t want the virtual deck to kill the mood, one ingenious soul decided to build a remote card-holding apparatus dubbed Vanna, which reminds me a little of a scrabble tile holder. 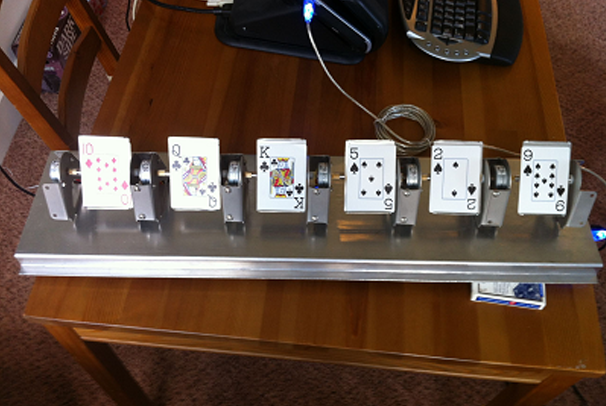 The idea is that while you’re playing a card game over a webcam, the device holds the opponents' cards facing away from you at a slight angle. Your opponents' webcam is set up to see the faces of the cards and you facing them across from it. It doesn’t specify if both players can use them at the same time, but I don’t see why not. Your opponent on the webcam can operate the device over the internet. If your opponent wants to get rid of any cards, say in a game of 5-card draw, they can instruct the machine to rotate a tray towards them, dropping the card face down below the tray without you ever seeing it. When it’s time to show your cards, all the trays flip around showing the opponents’ hand. These flipping motions are hard to describe, but the video makes it a bit clearer. There are some pretty detailed schematics online for you to check out, if you’re into that sort of thing. I didn’t see any code on the site, though, so if you’re thinking of building your own, you might need to code it yourself, or get in contact with the bot's creator to try to get a hold of what he used. As for the idea itself, it’s pretty cool, but the person dealing will have to get pretty good at setting up the trays without looking at the cards. Another robot to deal the cards will solve this problem, methinks.